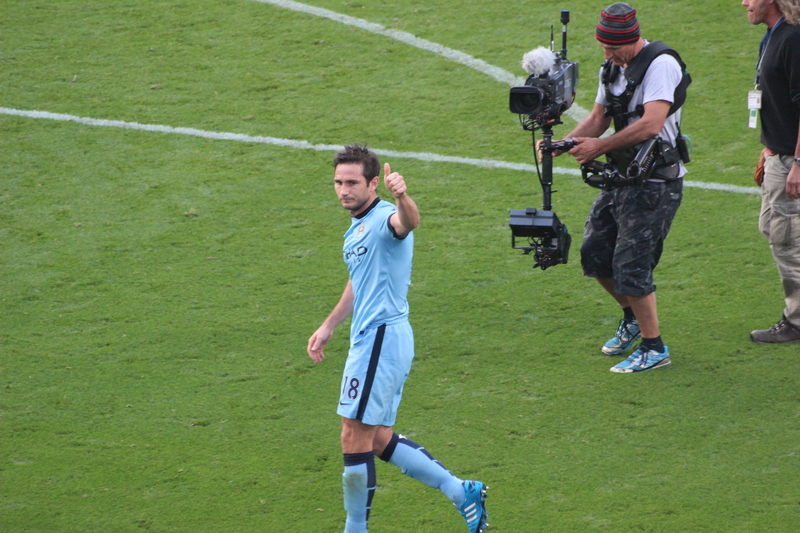 Manchester City vs. Chelsea : 21 September 2014. I was on the road at 9.30am. It would be another long day in support of Chelsea Football Cub, and my third successive away game in the North-West. Somerset, Wiltshire, Gloucestershire, Worcestershire, Warwickshire, Staffordshire, Cheshire, Lancashire. M4, M5, M6, M56, M60. Leigh Delamere, Michaelwood, Gloucester, Strensham, Frankley, Hilton Park, Stafford, Keele, Sandbach, Knutsford. West Bromwich Albion, Walsall, Manchester United, Manchester City. In addition to myself and His Lordship, I was travelling north with Nick and James, two football-mad young’uns from Chippenham. Nick, the Chelsea fan, has been working in the same office as me for a couple of months. When a ticket or two became available for our clash with Manchester City, he jumped at the chance. Nick’s only other Chelsea away game was the League Cup tie at nearby Swindon Town a year ago. This one was different gravy. To be honest, it was different pie, chips and gravy. There wasn’t the maddening traffic on the M6 as for the Burnley and Everton games, but it still took me five hours to park up at the usual place a few hundred yards from The Etihad, formerly the City of Manchester Stadium and formerly Eastlands. On the drive in, I’d given Nick and James – new to this part of England – a whistle stop tour of the area outside Old Trafford. A few miles away, the sun was shining on the sky blue clad match-goers headed for The Etihad. The area around the stadium is flat and there is a sense of space. City’s ground, about to be enlarged further after only ten years, has the feel of an American multi-purpose super stadium, with spiral staircases appended to the structure and large car parks adjacent to the bright bulk of the stadium. Outside the away entrance, a gaggle of familiar faces. I was able, thankfully, to sort out a couple of spare tickets for Greg, over from San Antonio in Texas for this one game, and his mate Jesse from Australia. I had taken Greg to Old Trafford during the 2006-2007 season, when we had called to see the new gleaming structure of City’s new pad en route to a quick visit to the iconic Salford Lads Club before the game in the red quarter of this city. I was inside with an hour to spare and relaxed with a pint. This was, unbelievably really, my tenth visit to City’s new stadium; I had visited Maine Road just three times. I chatted to The Bristol Four about the possibility of Frank playing against us. There was a general consensus that should he play, his mind might well be muddled with emotion. There was a sense that this might work to our advantage. A couple hoped that he would stay on the bench. I wasn’t sure what to think. There was even some nonsense in the media about us booing him. Meanwhile, news came through of Manchester United’s incredible capitulation at Leicester City. Inside the sky blue bowl, the two sets of players were finishing off their pre-match drills. My focus was drawn to a lone figure away in the distance. It was Frank Lampard, knocking balls to an unknown team mate. To be able to see Frank in the flesh, at a Chelsea match, but not part of Chelsea Football Club was a difficult sight to rationalise and make sense of. The stadium slowly filled to capacity and the first few opening volleys took place between the two sets of supporters. We were then treated to a montage of flashing iconic images of Manchester City history on the large TV screens in opposite corners of the stadium – from Paul Dickov to Sergio Aguero, from Dennis Tueart to Shaun Goater, from Mike Doyle to Vincent Kompany, from The Kippax to The Etihad – which was backed by a never-ending passage of ridiculous prose honouring “this city” which was delivered in an increasingly dramatic Mancunian drawl. It was full of emotive hyperbole. It left me feeling exhausted. With the kick-off just minutes away, the PA played “Blue Moon” and the home support grew livelier. Despite my comments to the Bristol Four in the concourse about the Manchester United defeat energising the City fans, the stadium had been relatively subdued until that point. The Chelsea team contained nine ever-presents in the league campaign thus far. There was the usual mix of names in the seven defensive positions; Courtois in goal, Ivanovic, Terry, Cahill, Azpilicueta in defence and Matic and Fabregas in midfield. Hazard, one of the three attacking midfielders, had played in all the previous four league games and he would be facing City too. Jose Mourinho has only decided to mix things up this season in the final two positions of our attacking trio. On this sunny afternoon in Manchester, it would be the turn of Willian and Ramires, rather than Oscar and Schurrle, to play alongside Hazard. In attack, the last ever-present Diego Costa was recalled. Here was a stable Chelsea team. With City in all sky blue, it seemed to make our all royal blue kit look darker, more menacing. I approved. After the joy of last season – probably only bettered by the day out at Anfield – I was full of hope that we would get at least a point. However, there is no doubt that the home team were quicker out of the traps. In fact, for the greater part of the first-half, Manchester City enjoyed the greater share of possession, and looked especially dangerous down the flanks. Cesar Azpilicueta, especially, was given the run-around. I was stood next to Gal, and we both sensed that we might concede an early goal. Thankfully, this never materialised. This was mainly due to some staunch defending and some errant City final balls. Then a dig at City. The first-half was a feisty affair with referee Mike Dean quickly brandishing yellow cards in an attempt to gain control of the game. One of the early highlights was a physical tussle between Diego Costa and Vincent Kompany away in the distance. Yaya Toure, a player who always seems to dominate City’s play, was at the centre of the action, withholding Chelsea challenges, spraying passes and chipping impudently over our defence to play in others. As the first-half wore on, I was desperate for us to reach half-time unscathed. However, for all of City’s possession, they rarely threatened our goal. This was a cagey and nervy game and was being played out in an increasingly muted atmosphere. The Chelsea support was split into two tiers, this making a sustained barrage of noise difficult. Last season’s game – the Mourinho master class – was a lot more open. Our forays into the City half were short-lived affairs. It was almost as if our players were only given a limited supply of oxygen once their bodies had crossed the half-way line, and were soon scurrying back to renew their air supply. Our midfield was constantly out-muscled and the memories of last season’s game seemed distant. Only a flurry of late corners towards the end of the first-half gave us much to cheer. An Ivanovic header caused us to roar, but little else brought us any cheer. Down below, I momentarily spotted Nick and James in the second row of the lower tier and wondered what they thought of it all. I had promised them tons of noise in the away end, but I began to doubt myself. Just before the second-half began, more music to inspire the home supporters; this time “Hey Jude.” How odd that a Liverpudlian band gets star billing at a Manchester stadium. Of course, it’s a song that we have adopted too, so we joined in at the key moments. Chelsea attacked the three thousand away supporters in the second-half. It was still a cagey affair which had yet to fully ignite the passions of both sets of supporters. After fifty-five minutes the surprisingly quiet Sergio Aguero sent a low rasper towards our goal, but Courtois did well to drop his body low and block. Jose brought on Mikel, who did well in last season’s game, and Schurrle, allowing Fabregas to move forward. Zabaleta, already booked, tussled with Diego Costa, and in the ensuing debate between the native Argentinian and the native Brazilian – I’m tempted to call it argy-bargy – Mike Dean saw fit to give both a yellow card. This stirred the pot nicely. For the first real time, The Etihad erupted in noise. The stadium has yet to gain a reputation as a cauldron of noise – unlike the din which emanated from the low dark stands of Maine Road – but for a few moments the stadium was alive. Though – wait a minute. This is a Mourinho team. I imagined the awkwardness now coursing through our manager’s veins. The chance was there, but would he give the order to attack and exploit possible spaces in the City rear guard? Initially, the signs were not good. With City back-peddling, I grew frustrated at our lack of desire to support each other by running into space. One or two spells of possession stumbled. There was a missing quotient of vitality. Then, the move of the game took us all, if I am honest, by surprise. A lovely passing move found the pacey run of Eden Hazard out on the right. His absolutely perfect ball into the penalty box evaded Joe Hart and super-sub Schurrle arrived to stroke the ball into the net. One player up, one goal up, we were winning at City again. For a few moments, both team and supporters were on fire. Diego Costa had been battling hard throughout the afternoon with little opportunity to test Hart. However, a leap and header gave us hope of a second, but the effort was saved. Straight after, our centre-forward wriggled away from a marker to give him enough time to strike a low shot at goal from inside the box. The shot rebounded off the base of Hart’s left post with the England ‘keeper beaten. The City manager Pellegrini had previously brought on Sagna and Navas, but when a third substitute was seen warming up in front of the technical areas, the away fans did not need much coaxing to start a long and heartfelt song of praise. Yes, Frank was on the pitch and playing against us. I’ll admit it. It felt wrong. So wrong. Yet we don’t know the exact wording of the contract that our beloved former player signed with New York City FC, nor the conversations that may or may not have taken place leading up to his loan period at Manchester City, nor his thoughts about playing in the Premiership against us. It just felt so wrong. Frank took his position in the centre of the field and lost control of a pass. His next touch would be surreal. A ball was played in by the terrier-like James Milner and a City player met it sweetly, steering it cleanly into Courtois’ goal, just inside the post. Within a split second, I realised who that player was. I turned away in disbelief. My first immediate thoughts – instantly – were of the handful of Chelsea supporters who, on internet forums and chat pages – had denounced Frank on his loan move to Manchester City. In my head, I heard the character in The Simpson’s pointing at us all. I banished the thought quickly as I saw Frank walk, crestfallen, slowly away from us, engulfed by his new City team mates. It was, of course, a stereotypical Frank Lampard goal. Then, the arrow to the heart; the City fans mocking us. But then, pride as I joined in the singing of the exact same song. In over forty years of watching Chelsea, there have been no more surreal moments. The rest of the match was rather a blur. Jose Mourinho brought on Didier Drogba who replaced Diego Costa. So, Frank Lampard playing for Manchester City and Didier Drogba playing for Chelsea. Just bizarre. A wild free-kick, from Didier, was our only chance on goal. It flew high over the bar. Everyone said, in the car and in the bar, before the game that we would have taken a 0-0 draw. So, in reality, I cannot complain about the outcome of the game. I would have liked a little more expansive play, but Mourinho is the shrewdest of all managers and would have been pleased with the draw, too. We had, after all, limited them to very few chances throughout the game. After the bonanza at Goodison, this was a more Mourinho-esque performance. These thoughts flitted through my mind as I gathered my camera to focus on Frank’s slow and solemn walk towards us. He clapped the City fans briefly, but saved the best for us. His face was stern, and certainly sad. There were no smiles. He gave us the thumbs up, and waved. How strange that Frank’s last game for us was against Norwich City and his last slow walk around the Stamford Bridge pitch was witnessed by only a few thousand. Now, maybe his last goodbye was in the colours of Manchester City. As he turned away from us, I detected some boos from the City fans to my right; I presume they felt that Frank simply should not have done that. After thirteen seasons, though, he remains one of us. “We won 2-0 mate” and he smiled. I soon met up with Parky, then Nick and James. They had had a fantastic time. As first “real” away games go, it would be hard to find a more memorable one. Outside on the Ashton New Road, a lone City fan was bouncing. “Who put the ball in Chelsea’s net? We walked silently on, but inside we were hurting. I then looked round to see Parky chatting to a City fan and his young lad. Not for the first time at City, I found myself shaking a City fan’s hand and wishing him all the best. With the alternatives – Manchester United, Liverpool, Arsenal – being too horrific to even contemplate, City represent, to me and to a few others, an almost palatable alternative to our fifth championship. Not all fans think the same way, evidently. We remained silent as we walked past a City fan who had been clumped ; he was on the pavement, clutching a bloodied nose. We soon reached the car. There was a quick analysis of the game as I headed east, then south, with the bright orange sun lighting up the sky. It was a beautiful evening. We had witnessed a crazy game of football. On the long drive home, there was a nice mix of chat, music and laughter. Nick and James promised to get themselves to more games. Parky – his ability to talk dwindling by the minute with every gulp of cider, so that in the end all that I could decipher were exclamation marks – slowly drifted off to sleep. James and Nick, however, were buzzing. I reached home at 11.15am, exhausted, but full of thought. It was too late to be too profound though. Five games in, we stand three points clear at the top of the table. This entry was posted in Season 2014-2015 and tagged 2014-2015, Andre Schurrle, Frank Lampard, Manchester City, Songs, Stadia by Chris Axon. Bookmark the permalink.